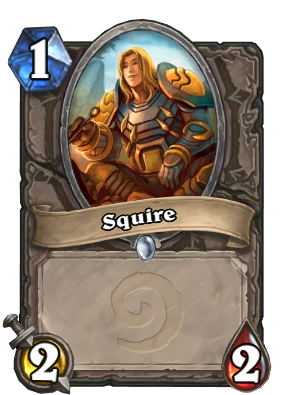 Inspire: Add a 2/2 Squire to your hand. 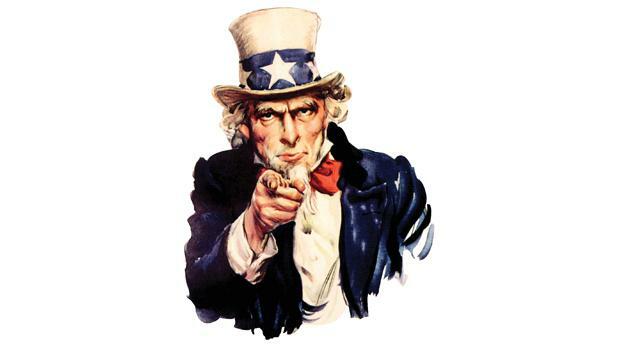 Join the Argent Crusade! We have attractive tabards and you get to carry really nice swords! This card has so much potential with the priest DK in a highlander deck with raza. It has a potential of 14 damage in one turn! This couldn't have been 4 mana? I mean, look atSavage Combatant. And don't give me that "Class cards are supposed to be better than neutral cards", this card at 4 mana is still worse than Savage Combatant. Once upon a time, Mittroms thought that this card was crap. Then Mittroms saw that the squire was 1 mana. Now Mittroms LUVZ this card. And Mittroms lived happily ever after with his awesome recruiter. The End. 5 for a 2/2 and then 1 for a 2/2 but before that Inspire for 2.... such a slow card. So, its a 8+ mana card? What is that golden animation? He looks like Aquaman trying to call fish to aid him with his sonar.... wha-....are the squires actually murlocs?? It's a lesser version of Cabal Shadow Priest's compelling mind waves. So he's actually using a lesser form of mind control to get recruits. It's a 5 attack minion: this card will trade favorably against a (e.g.) Chillwind Yeti, while Silver Hand Knight will not. There is a chance that you can get multiple Squire from a single Recruiter if it survives a turn. 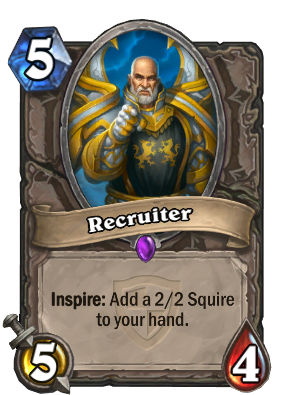 If there are 2 Recruiter on the board, you will get two Squire cards, drastically reducing the cost per Squire. And we haven't even gotten to the fact that there are TGT cards that reduce the cost of hero abilities and allow them to be used multiple times in a turn. So... this card is likely not any worse than Silver Hand Knight, and may even be preferable in most situations. this card is GT control rogue approved. thats right i called it first. i see all the pieces coming together and its glorious. i want it bad. Well Guys just think about it this way, IT'S an epic so you probably never will have to pick it in arena. I thought it was Mr. Clean. You wouldn't, it's just card draw I guess. Maybe sometimes it's better than flooding the board but eh. why i should play this instead of Silver Hand Knight? I think the idea is to put cards in hand not to put minions in play. Perhaps synergy with cards like Mountain Giant.